Funeral Fund Blog: Seven unusual funeral practices that you may not have heard of. Seven unusual funeral practices that you may not have heard of. Funeral practices are deeply ingrained in culture and vary across the globe. These sometimes unusual traditions reflect a wide spread of beliefs and values. Here, is a look at seven funeral traditions that you might not have heard of. 1. South Korean burial beads. In South Korea, it’s not ashes to ashes, but ashes to beads.There was a law passed in 2000 in South Korea, requiring anyone burying a loved one to remove the grave after 60 years. Due to a scarcity of graveyard space and this resulting law, cremation has become much more popular. Unlike the US, families don’t always opt for ashes in an urn. Several companies there compress cremains into gem-like beads in turquoise, pink or black. These “death beads” are then displayed in the home or worn. Many ethnic groups in the Philippines have unique funeral practices. The Benguet of Northwestern Philippines blindfold their dead and place them next to the main entrance of the house, while their Tinguian neighbors dress the body in their best clothes, sit them on a chair and place a lit cigarette in their lips. The Caviteño, who live near Manila, bury their dead in a hollowed-out tree trunk. When someone becomes ill, they select the tree where they will eventually be entombed. Meanwhile, the Apayo, who live in the north, bury their dead under the kitchen. 3. 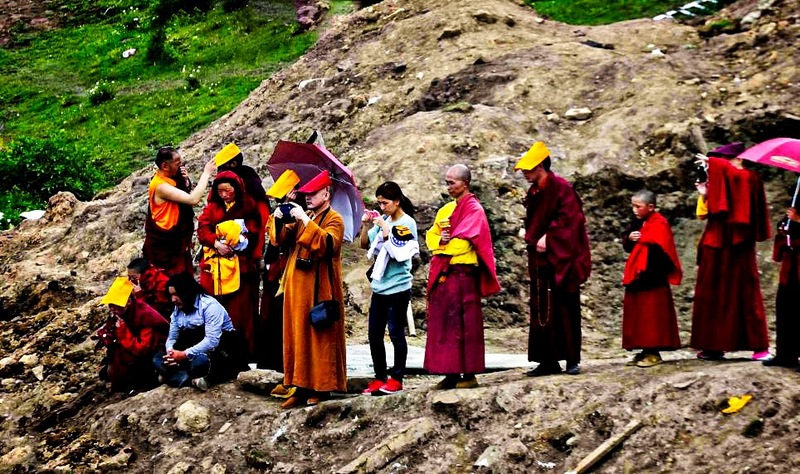 Sky burial in Mongolia and Tibet. Many Vajrayana Buddhists in Mongolia and Tibet believe in the transmigration of spirits after death – the idea that the soul moves on, while the body becomes an empty vessel. To return it to the earth, the body is chopped into pieces and placed on a mountaintop, which exposes it to the elements — including vultures. It’s a practice that’s been done for thousands of years and about 80% of Tibetans still choose it. 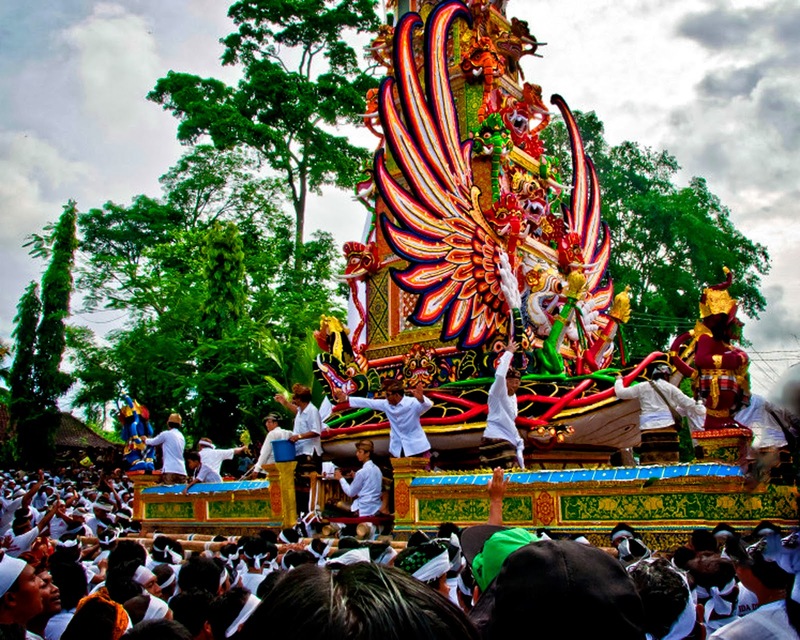 Cremation ceremonies in Bali are quite extravagant and some would say – fun. In 2008, the island saw one of its most lavish cremations ever as Agung Suyasa, head of the royal family, was burned along with 68 commoners. Thousands of volunteers gathered to carry a giant bamboo platform, as well as an enormous wooden bull and wooden dragon. After a long procession, Suyasa’s body was eventually placed inside the bull and burned as the dragon stood witness. In the Balinese tradition, cremation releases the soul so it is free to inhabit a new body — and doing this is considered a sacred duty. Aboriginal mortuary rites in Australia. 5. Aboriginal mortuary rites in Australia. 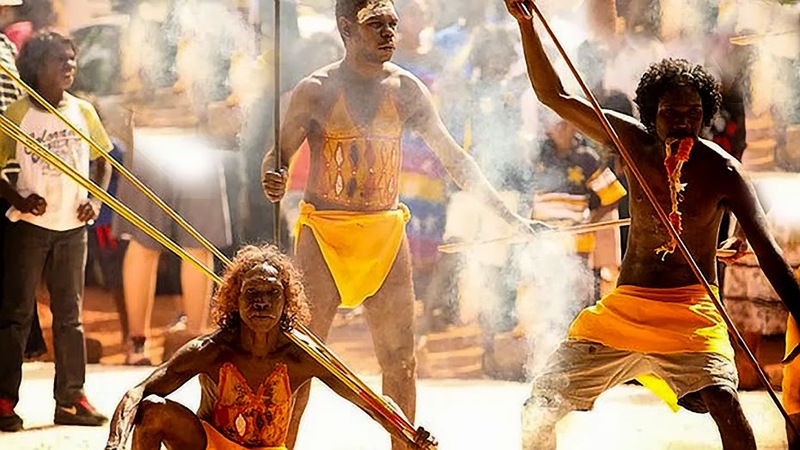 When a loved one dies in Aboriginal society in Australia’s Northern Territory, elaborate rituals are performed. First, a smoking ceremony is held in the loved one’s living area to drive away their spirit. Next a feast is held, with mourners painted ochre as they partake in food and dance. The body is traditionally placed atop a platform and covered in leaves as it is left to decompose. It has been reported that in some traditions, fluids from the platform can help identify the deceased’s killer. In Ghana, people are buried in coffins that represent their work, hobbies or something they loved in life. These so-called “fantasy coffins” can be as different as a coffin shaped like a Mercedes-Benz for a businessman to an oversized fish for a fisherman to a really big Bible for someone who loved going to church. 7.The "turning of the bones" in Madagascar. 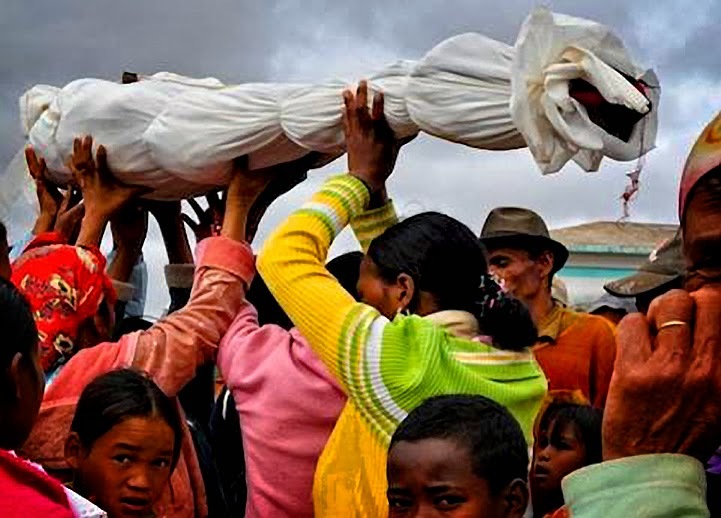 The Malagasy people of Madagascar have a famous ritual called “famadihana” or “the turning of the bones.” Once every five or seven years, a family has a celebration at its ancestral crypt where the bodies, wrapped in cloth, are exhumed and sprayed with wine or perfume. As a band plays at the lively event, family members dance with the bodies. For some, it’s a chance to pass family news to the deceased and ask for their blessings — for others, it’s a time to remember and tell stories of the dead. And, there’s lots of dancing. The "turning of the bones" in Madagascar. In other countries and societies, it’s not always black that signifies death, as it does in the United States — white, purple, grey, green and yellow also mark the passage of life. The phrase “Death takes a Holiday” is a reality in many cultures outside of our own. In the United States, more and more people are opting for environmentally friendly burials. Green funerals means skipping embalming processes, nixing traditional concrete vaults and getting biodegradable, woven-willow caskets, which decompose into the ground. The Green Burial Council has approved 40 environmentally friendly cemeteries in the U.S. — way up from a decade ago. Another option: becoming a memorial “reef ball.” A company called Eternal Reefs compresses remains into a sphere that is attached to a reef in the ocean, providing a habitat for sea life. Thanks.